Cheesy Ranch Chex Mix - SO addictive! People go crazy over this at parties! Cheez-Its, Chex cereal, peanuts, pretzels, butter, worcestershire and Ranch. Can make ahead of time and store in an airtight container. Great for tailgating and the holidays. Always a hit! WARNING! 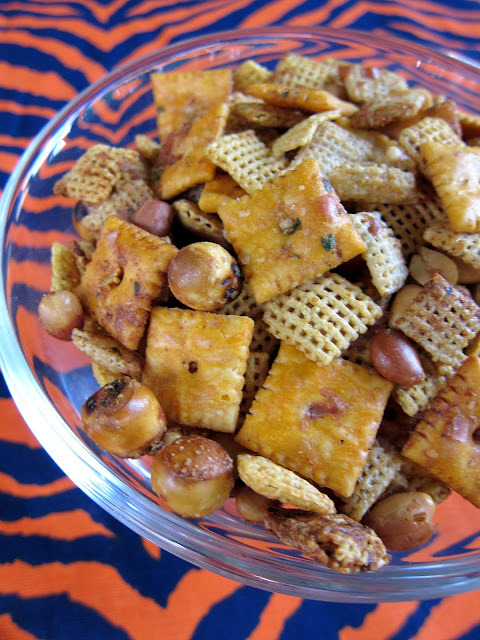 This snack mix is highly addictive! This is the kind of snack that you can eat a ton of. It gets better with every bite. This combines all of my favorite flavors - Cheez-Its, peanuts and Ranch! YUM! I baked the snack mix in the oven, so it was nice and crispy. This will for several weeks in an airtight container. This is great for tailgating and the upcoming holiday season. This is super quick and easy; mix up a big batch today! In a large bowl (the biggest you have), mix together all ingredients. Place mix on 2 large baking sheets. Bake 1 hour - stirring every 15 minutes. Allow to cool and transfer to an airtight container. This just might be my new favorite snack! Oo I do love me some Chex Mix, especially over the Holidays! I am looking forward to fixing this! Thanks for the idea....neighbor treats for the holidays. And some for me, too! I mean....for me, ESPECIALLY! Have you ever tried the bagged chex mix from the stores? It tastes nothing like the wonderful homemade stuff. I'll give yours a try. Might be a good idea to mention the butter should be melted.. I made this for a snack before Thanksgiving and Christmas dinners with the family and it was a hit! I used Bugles for the Thanksgiving version, as little cornucopias! Thanks for the recipe!